Now and again, you discover a comedy that balances hilarity and emotion perfectly. Sideways is a refreshing, intelligent and moving film that remains interesting, comical and complex from start to finish. Miles and Jack appear to have very little in common. Their morals, interests and ambitions are worlds apart and yet the two men, who met at college and who are now coping with their middle age, have remained friends throughout the years. To celebrate Jack’s upcoming wedding, the two men venture across the California wine country. Both men have very different plans for the week and as their predicted weeks collide, a charming and compelling story is brought to life. Alexander Payne, director of Election and About Schmidt has conquered comedy before, but through Sideways he also successful delivers emotion and tragedy. Sideways is a substantial film that surprises and delights. The blunt comedy and the bizarre situations that Miles and Jack find themselves in is reminiscent of the Coen Brothers’ filmography. The characters are quirky, wild and unpredictable. Yet there is a beloved middle class snobbery that makes Sideways charming in the same way as Woody Allen’s Annie Hall or Hannah and Her Sisters. Miles deals with divorce, lost love, new love and personal loathing in a similar way to Allen. His passion for literature and good wine shape his character and make him a character we enjoy hating, pitying and rooting for. His flaws are clear for all to see, as well as Jack’s. Giamatti is perfect casting. His use of expression highlights Miles’ woe and inner conflict and his delivery is caped in bitterness and passive aggression. He is ever so slightly unhinged and his unstable state adds a complexity to the story that draws us in. Jack is a much more obvious and shallow character but he is the perfect contrast to Miles and together the two characters challenge, irritate and support one another. Sideways demonstrates the limits that friendship can be pushed to and the distance that can develop over time. The two female characters are well thought out. Well acted and well written, both Maya and Stephanie compliment the male protagonists and compliment the narrative. Gender is explored, fairly and artistically. Comedy and emotion are balanced and improved by one another. The anguish and paranoia of a Woody Allen film, contrasted by the absurdity of a Coen Brothers’ movie allows Sideways to develop and mature as time passes, much like a fine wine. Alexander Payne also demonstrates here just how crucial script-writing and character is to contemporary cinema, specifically comedy. Knowing the characters well means that we find the things they do, the errors they makes and the situations they are faced with even more amusing. Miles is a sad character, a failure to himself and therefore a stranger to those who try to get close to him. His inability to let others love him holds him back and also drives his story forward. Payne has explored a character who is so frustrating and, yet somehow, so understandable. Characters and their imperfections are the most precious thing about Sideways. 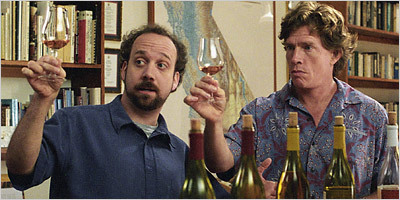 A film that needs to be watched several times to be truly appreciated and a film that needs to be watched, everytime, with a large glass of pinot noir; Sideways is pure comedy conviction. Tags: Alcohol, Alexander Payne, American cinema, American Film, Cinema, comedy, Drama, film, Movie, Paranoia, Paul Giamatti, Review, Romance, Sideways, Wine. Bookmark the permalink. Previous post ← The Magic of Tom Hanks.